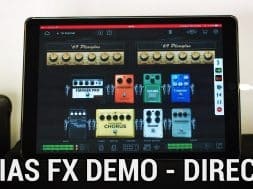 Here’s one for the guitarists – all sound captured comes straight from the output on the iPad Pro, recorded into Auria Pro. There were a few points in the demo where the output levels went above 0dB and clipped (but I couldn’t hear it, oops) so there are a few nasty sounds dotted around. Sorry. How to capture a video of your iPad screen!